The best sound quality in your car can make the difference between a boring and an enjoyable driving experience. Oftentimes, the factory-built car stereo or speakers do not give us the tonal quality we wish for. It could be affected by the car noise, engine noise, reflectivity of the glass or any other component. You may therefore wish to get the best car audio equalizer. I have handpicked the 5 best products on the market. 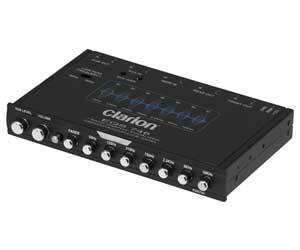 Clarion EQS755 is in giving you an optimized sound. Thanks to its 7 bands such as 50 Hz, 125 Hz, 315 Hz, 750 Hz, 2.2 kHz, 6 kHz, and 16 kHz. The product comes with the integrated low pass filter with 6 channel and 8 volts of RCA outputs at the front, rear and at the subwoofer. Furthermore, it has the 3.5mm AUX input at the front with variable gain adjustment RCA and high level speaker inputs. All controls are within reach thus making this equalizer a number one choice for car owners. Moreover, it features the blue illumination, the independent subwoofer level and master volume control with fader control. All these combined give you a superior control of the sound quality with frequency adjustments. The tone of music is in your hands. Gone will be the tolerance over mediocre sound often provided by factory stereos and speakers. If you are a fan of fine-tuning the music to your taste, this graphic equalizer will give you that control. The frequencies that get distracted by your car’s inner components can be compensated by this quality graphic equalizer. I couldn’t find potential downside except not seeing the warranty details. This is a must-have product for all your sound quality and frequency needs in your car. It gives you a full control. 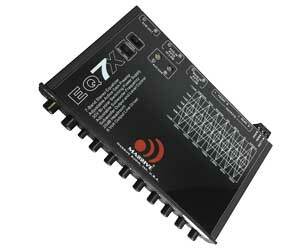 Here is another quality equalizer with 7 bands to get your audio sound from mediocre to a jaw-dropping quality. EQ-7X Equalizer also features the crossover whose function is basically to limit the range of frequencies sent to the speakers or amplifiers. The end result will be a fine-tuned sound quality on your subwoofers, tweeters and mid-ranges. The equalizer, on the other hand, gives you a full control over the entire system. 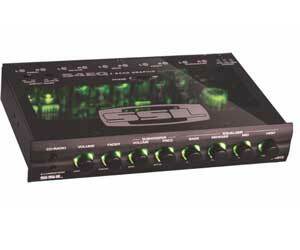 This graphic equalizer is top-rated and has received many positive reviews from many customers. It will correct the discrepancies of sound caused by distractions of the frequencies. With just a tap to the switch, you can change the LED color from red to blue to illuminate the interior. Also noteworthy to this equalizer is its complete tuning control. It features 6 channels with 7 volts RCA outputs. The master volume level and subwoofer level are adjustable to your preferences. Other notable features include the 2-channel RCA Aux input and the adjustable gain. The terminals are gold-plated, so goodbye to corrosion. More sound quality is achieved with the selectable 12 decibel low-pass crossover (60Hz or 90Hz). It shouldn’t take you the whole day trying to install this equalizer. In fact, it’s one of the simple installations I have come across. If all you want is a high-quality equalizer regardless of the price tag, then this could be your best buy. It gives you the freedom to fine-tune your car audio sound quality. S4EQ Car Equalizer is also a potential equalizer to boost your audio quality. It comes with gold-plated front, read and subwoofer inputs. This prevents corrosion if exposed to harsh factors such as humidity or mist. Looking at the price, it’s easy to be fooled and then decided the EQ is a substandard offering. It is affordable yet does not compromise its quality. Featuring dual color illumination, it will help decorate your car. Featured are the variable subwoofer filter, master volume and subwoofer level control. These are great control to give you a great experience of sound quality. This graphic equalizer allows you to view and control variable frequency brands with ease. It also provides rear, front and subwoofer low level outputs through the RCA connectors. If your car includes amplifiers in signal path, then this equalizer could be your best buy. Its band center frequencies are 40Hz, 150Hz, 1 KHz and 20 KHz while the boost at the center is plus or minus 18 decibels. The manufacturer gives you a 1 year warranty. This is a budget-friendly graphic equalizer for car owners. I do recommend the product with its great features. This BOSS Car Equalizer also makes a mark with its quality offerings. It features front adjustable band frequencies such as 125 Hz, 500 Hz, 3.5 KHz, and 12 KHz, and rear adjustable band frequencies such as 50 Hz, 600 Hz, and 6.3 kHz. Its maximum input voltage is 15 volts and the maximum output is 8 volts at the front, rear and subwoofer. Also, its subwoofer filter can be varied from 32 Hz to 128 Hz. The equalizer has a frequency response ranging from 10 Hz to 15 kHz. Also notable with the equalizer is the signal to noise ratio which is greater than 100dB and channel separation of 20dB. The installation part is an absolute breeze. The manufacturer gives explicit instructions on how to ace the installation, so this shouldn’t be cumbersome at all as the EQ also features the universal half-DIN chassis. For each band, there is a specific bandwidth. And, its low-noise BI-FET op-amp gives minimum distortion while the 20dB headroom cuts the signal overload. On overall, this is a great equalizer for high-quality audio system. This equalizer is worth the price of money. It has a broad range of features to make your sound quality achievable with minimum distortion. Planet Audio is yet another Half-DIN EQ which is easy to install. It has 4 fixed bands (high, mid, low and sub), and adjustable subwoofer output filter. It also has the selectable 12dB of boost/cut adjustment. The equalizer gives you more flexibility with its adjustable gain control and subwoofer crossover. Moreover, with the master volume control, fader control, subwoofer level control you will have a complete control of the sound output and tonal quality. The EQ’s night illumination is a marvel to have. All in all, this equalizer helps control the levels within the audible frequencies of the stereophonic system. Unlike the aforementioned equalizers, this one is not graphic but parametric. It also has the front, rear and subwoofer RCA outputs. The center frequencies, adjustable to -/+12dB, are 75 Hz, 200 Hz, 2 kHz and 20 kHz while the frequency response ranges from 20 Hz to 20 kHz. The subwoofer crossover frequency is variable from 45 Hz to 180 Hz. The equalizer is worth the value of money. I wouldn’t hesitate to purchase given its superior controls that provide you with a rich sound experience. It boosts mediocre sound. Driving the vehicle becomes more enjoyable when you have high-quality sound system. Factory stereos and speakers often lack in this provision. So, the aftermarket equalizers come as rescuers with the best features. I have provided you the top products on the market. Any of this products should help you improve your car audio sound quality.